. Whereas the previous Stabil MC 5 was a mid-range, traditional (albeit fairly light and flexible) Motion Control Shoe, the Stabil CS is a top-end shoe which feels and performs as such. It's on a new high-volume, straight last, which has a very broad base to provide stability. It's also gives a great broad fit, ensuring plenty of space for even the widest of feet. The CS zone is a dual-density structure which is full length, but only extends halfway up the midsole. The enables the shoe to give maximum stability, but by having the flex grooves cut into this zone it retains flexibility. The ProGrid Stabil CS 2 is a maximum feature, maximum motion control shoe designed for daily training and high mileage. It is built with a semi-straight shape.  Heel ProGrid with Respon-Tek is a foam grid like piece that sits under the heel and is designed to absorb heel strike energy.  SRC Forefoot Cushioning sits under the metatarsal region and is designed to provide a smooth toe-off.  CS Zone is a bottom-loaded, full-length, dual-density medial post and is designed to control excessive pronation while maintaining shoe flexibility. 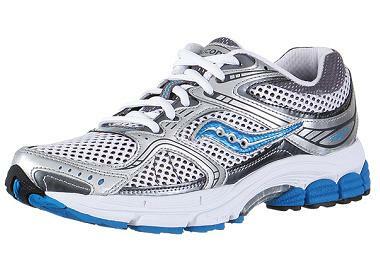  Blown Rubber is located at the forefoot and is a lightweight flexible material that is designed to enhance cushioning and provide a smooth ride.